On Videos for hours and hours - Visual Container New Media Screening..
A day dedicated to the actual trends of national and international videoart.With screenings from a compilation about the identity of the present-day video languages and times of conversation with the curators. On the grounds of direct comparisons with art professionals and practitioners, it is apparent that videoart is a form of contemporary art that, despite existing for over fifty years, has not yet been assimilated by the art audience in our country, even though they are familiar with the most important art galleries. In particular, it is possibly even more difficult to keep up with the video offerings of our very days, as a most diverse range of languages and proposals files under the name of videoart, from the most conceptual expressions to the contamination with performance, audio-visual multimedia research and artist’s film. Whatever such expression may be, videoart is an art form increasingly in vogue in the contemporary scene as being very similar to the communication and social issues of our time and capable of showing artworks that are completely in tangency with the aesthetic and poetic values in current painting and photography. 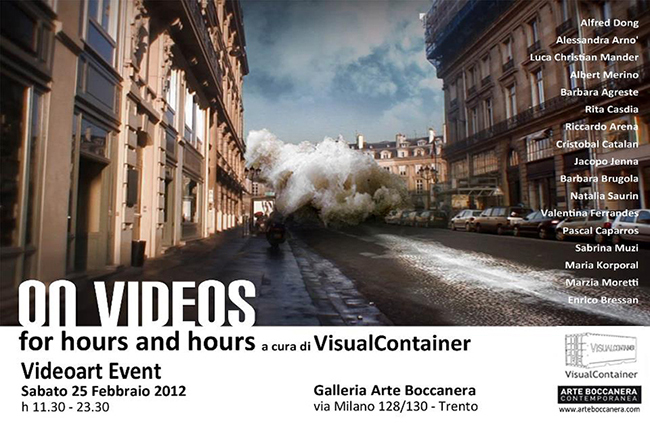 On such basis, VisualContainer believes that the opportunity to spend a whole day at the Arte Boccanera Contemporanea gallery introducing and discussing the most recent Italian videoart production would be a truly valuable and stimulating opportunity. ON VIDEOS for hours and hours therefore proposes a special videoart and new media screening, aimed at providing an overview of the possible aesthetic and poetic sceneries of videoart at the beginnig of the third Millennium, by presenting a selection of works produced in the last three years. Of course, it is very very difficult to demarcate the precise boundaries of contemporary art research and propose final categories with certainty, also because, as above mentioned, the essence of videoart lies in the continuous movement of expressive formulas, but it seems rather reasonable to tell at least 9 categories that could identify what is being proposed by the artists in Italy in the first decade of Y2K, in absolute tangency with what’s also presented at an international level. For every time, there is a zeitgeist and video art, like the other forms of contemporary art, is once again so abreast of it to provide the most expressive and questioning voice, as very well expressed by the screening on show. Presented Artists: Alfred Dong, Alessandra Arno’, Luca Christian Mander, Albert Merino, Barbara Agreste, Rita Casdia, Riccardo Arena, Cristobal Catalan, Jacopo Jenna, Barbara Brugola, Natalia Saurin, Valentina Ferrandes, Pascal Caparros, Sabrina Muzi, Maria Korporal, Marzia Moretti, Enrico Bressan.